Background: Minimally-invasive gastric fundoplication represents an important therapeutic option in patients with refractory reflux and symptomatic hiatal hernias. Preservation of esophageal and gastric function is a hallmark principle in ensuring optimal surgical outcomes. In this study, we evaluate the impact of fundoplication on esophageal transit and gastric emptying scintigraphy studies, and relate these functional findings to symptomatic outcomes. Methods: Ninety consecutive patients (34 female, 56 male) with both pre- and six month post-operative nuclear scintigraphy studies undergoing partial (Toupet) fundoplication at a single institution were analyzed. Primary variables included alterations in esophageal transit and gastric emptying times subsequent to fundoplication (1=rapid, 2=Normal, 3=mild delay, 4=severe delay). Symptomatic variables included heartburn, regurgitation, dysphagia, pulmonary symptoms and bloating. Results: Mean age was 55.6. Symptomatic improvement was achieved in 89%, at a minimum follow-up of 6 months. Significant improvements in heartburn (88% vs. 20%, p=0.01) and regurgitation (56% vs. 1%, p=0.002) were noted. There were trends in improvement of pulmonary symptoms (28% vs. 9%) and increased gas bloating after fundoplication (3% vs. 22 %). There was no significant difference in pre-op and post-op esophageal transit (2.51 vs. 2.48) and gastric emptying (2.13 vs. 2.07) scores subsequent to fundoplication. 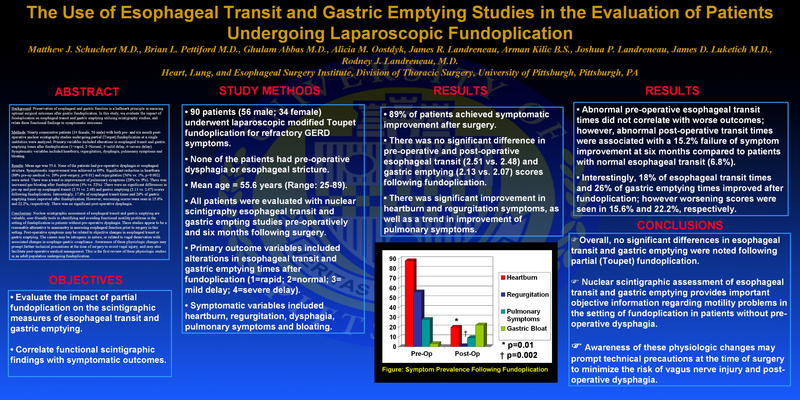 Interestingly, 17.8% of esophageal transit times and 26% of gastric emptying times improved after fundoplication, with a corresponding percentage of patients worsening (15.6% and 22.2%, respectively). Seven patients underwent dilation post-operatively for dysphagia. Conclusions: Gastric fundoplication can achieve significant symptomatic improvement in patients with refractory GERD (+/-) hiatal hernia. Post-operative changes in esophageal and gastric scintigraphy may help to delineate functional abnormalities related to vagal denervation. In addition, improvement in esophageal transit and gastric emptying may be related to resolution of the mechanical effects of an associated hiatal hernia, or alterations in esophago-gastric compliance. Nuclear scintigraphy studies afford objective data on perioperative esophageal and gastric motility without detriment in the assessment of patients undergoing fundoplication.